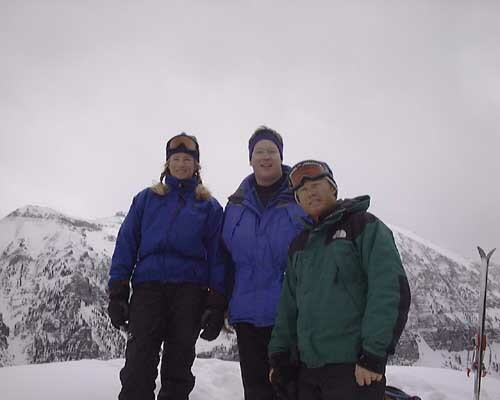 In March 2002 I visited my friends Lise, Lance, and Gus in Telluride, and had a really nice time. Below are some pictures from the trip. 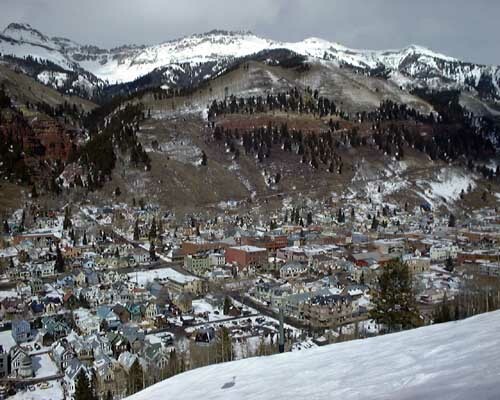 Also click here to see pictures from my trip a year ago including some pictures of their house, and click here for maps of Telluride and lift maps (the lift map is outdated now that Telluride has a Gold Hill lift). Lise took this picture of me after a short hike from the top of Prospect chair lift, a new chair at Telluride this year. Lise and I dropped into this Genevieve run after this picture was taken. 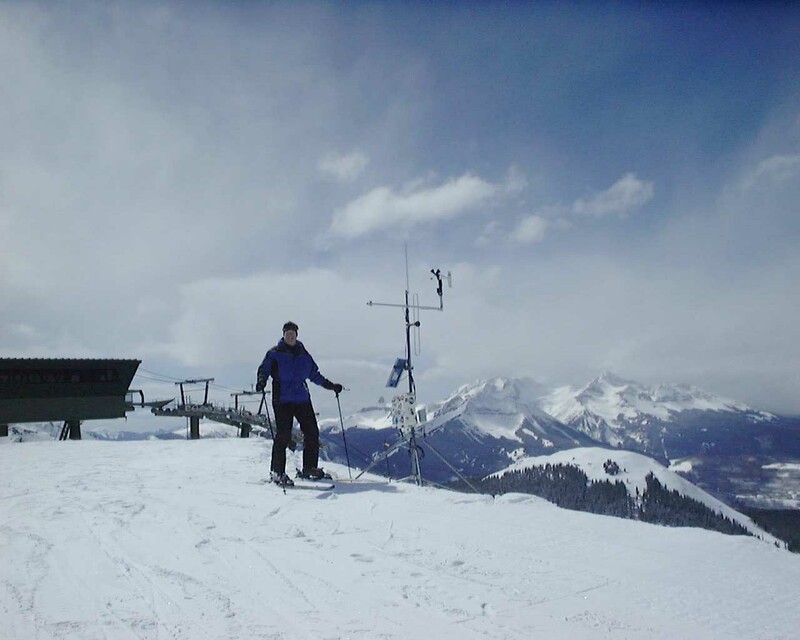 Lise took this picture of me at the top of the brand new "Gold Hill" lift. In 1999 I hiked up Gold Hill before there was a lift, you can read about it by clicking here. I stood in this exact spot in this picture taken in 1999, but there was no chair lift in the background. Here I am in a chute on Gold Hill, Lise is taking the picture from below. The chute is about as wide as my skis, and I think it is called "Dynamo" chute. 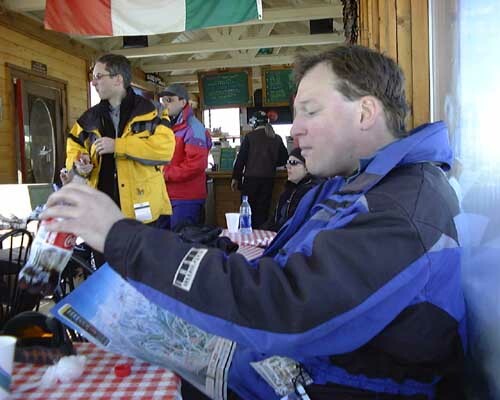 Here I am in Giuseppe's restaurant at the top of chair 9 in Telluride studying the lift map. Lise is documenting my trip pretty well. Just outside Giuseppe's there were some para sailers in the air. The next day, Lance and Lise decided to take me on a new run I had never done at Telluride called "Needle Rock Chute". It is a hike off to skier's right of lift 9. I had no idea it was even in the ski area. 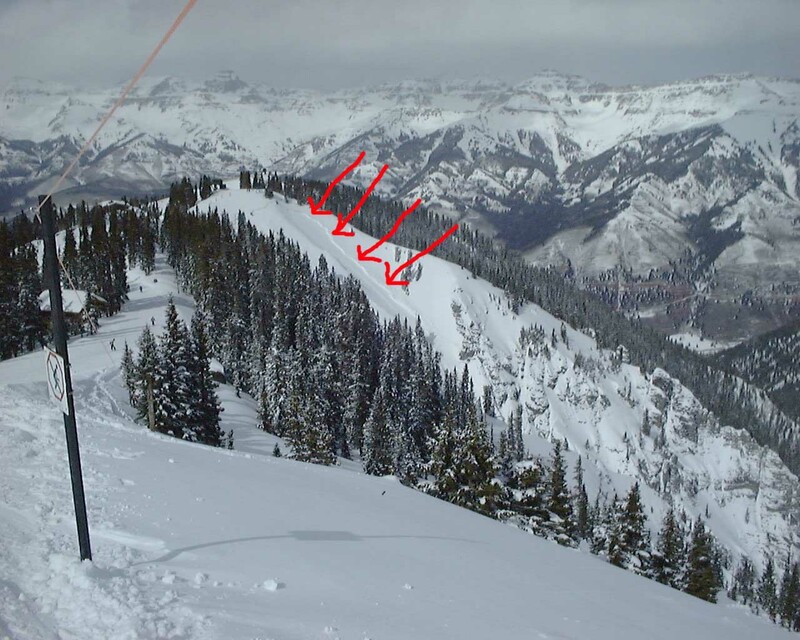 In the picture below, Lise and Lance are circled and labeled "A", and the top of the run we are going to take is labeled "B". Notice the cliff off to the right of where Lise and Lance are walking. I have to hike up that ridge right after them (yikes!) You can click on this picture to zoom in on the detail. At the top of Needle Rock Chute, that's Lance on the left, Lise on the right. At the very upper right corner of the picture you see the top of Lift 9, and the big wide open snow area in the "Bushwacker" run. Lise, me (Brian), and Lance at the top of Needle rock. Picture by a friendly stranger. From the top of Needle Rock, in the dead center is the top of lift 9, and you can see the runs Bushwacker, Mammoth, and Joint Point from left to right in the picture. 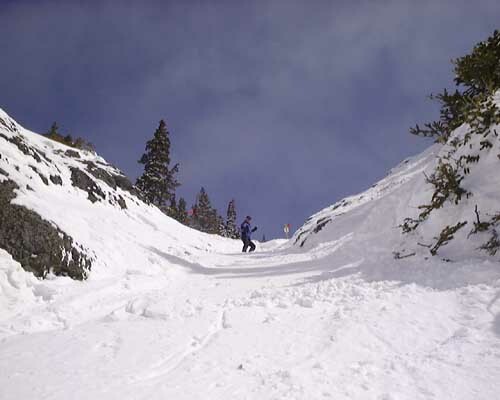 After skiing Needle Rock Chute, here we are riding lift 9 again, and this is a picture of the Needle Rock Chute from the lift. It is the thin white snow patch running vertically through the very center of the picture. The highest point of the hill is where the above pictures were all taken. The next day we got up early, and got some of the first tracks through some fresh powder. 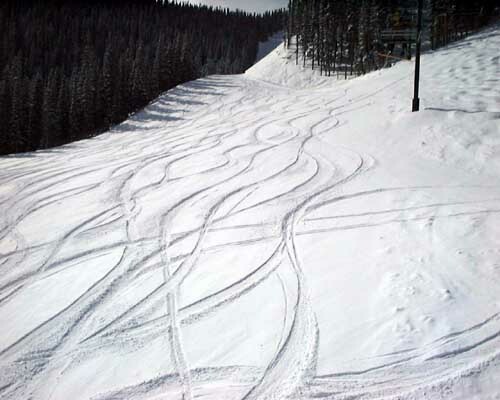 Here is a picture on the 3rd or 4th lift ride we took showing how it is barely tracked. That was a FUN morning! At a lunch break, I noticed this ski rig. It is a mono ski with rockets attached. 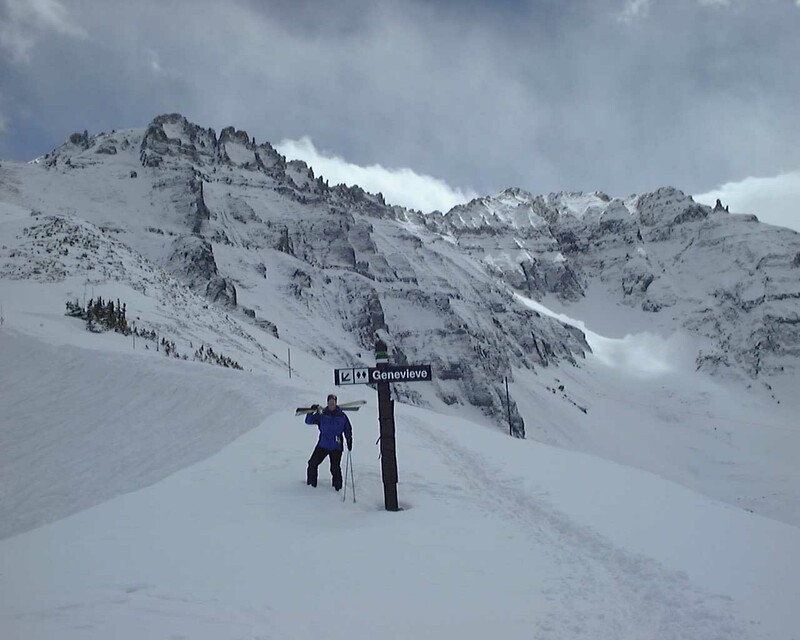 While I was in Telluride, a woman snow-border died in an avalanche when she and a friend ducked under a rope and skied "Temptation Bowl" which is closed (it is not legal to ski there because it is too dangerous). The picture below is the top of Temptation. It is a bad avalanche area, with a small "choke point" at the bottom where all the avalanche fury feeds into and as a skier you would be forced to exit through, and a cliff below that you must avoid. I took this picture to show the EXTREMELY bad judgment this woman exhibited. Those are frozen slabs of snow (click on the picture to see more detail) showing clear layers in the snow, a sure sign of avalanche conditions. The woman and her friend triggered the avalanche themselves. 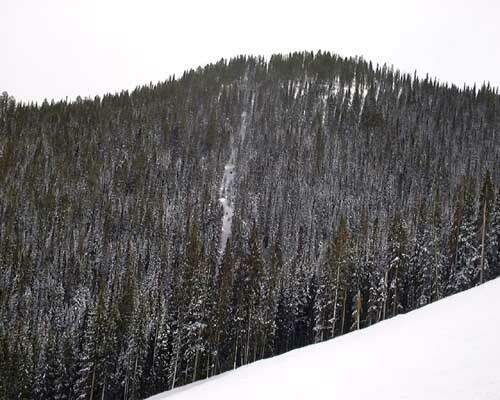 It released at 11,800 feet fracturing at 3 feet deep, and the avalanche ran down to Bear Creek at 9,600 feet (a 2,000+ foot slide) piling up to 30 feet deep. Three days later they still haven't found her body, and she had not been wearing an avalanche beacon which is designed for just such emergencies. Her friend broke his leg and was helicoptered out, but survived. I took the following picture while standing on Gold Hill, looking down at the back of chair 9. Under the red arrows you can see a huge fracture in the snow, marking an avalanche slide. (Click on the picture to see greater detail.) This is the same area the woman died in. 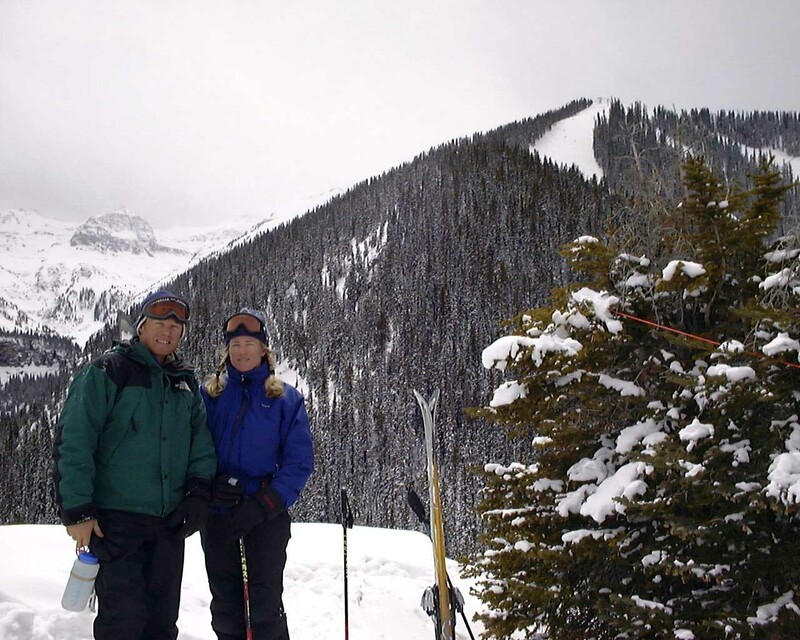 This woman died of stupidity-> snow is fracturing and sliding all over, she broke the law by ducking under a rope, the conditions were as bad as they could possibly be, and she wasn't wearing an avalanche beacon. 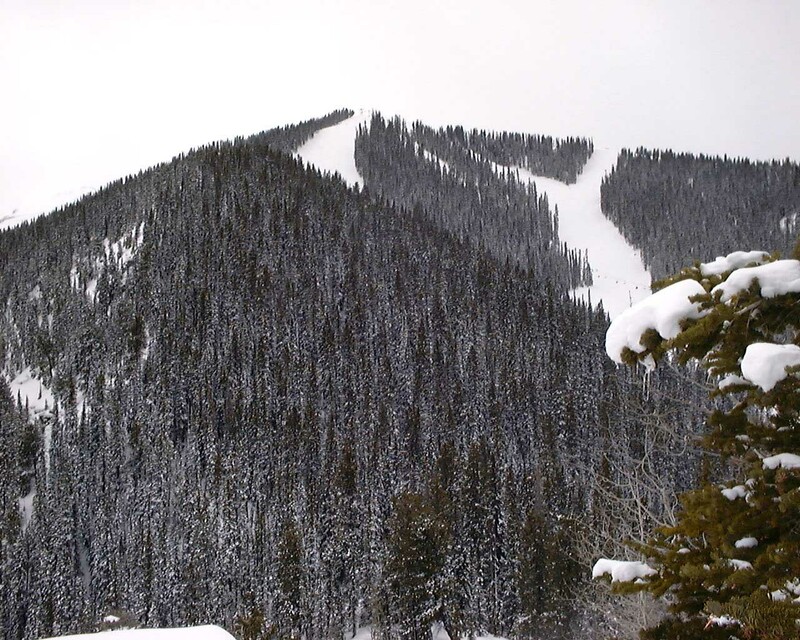 The accident happened on March 15, 2002, and the woman's body was not recovered until mid-May (2 months later) because it was buried under so much snow it could not be found. 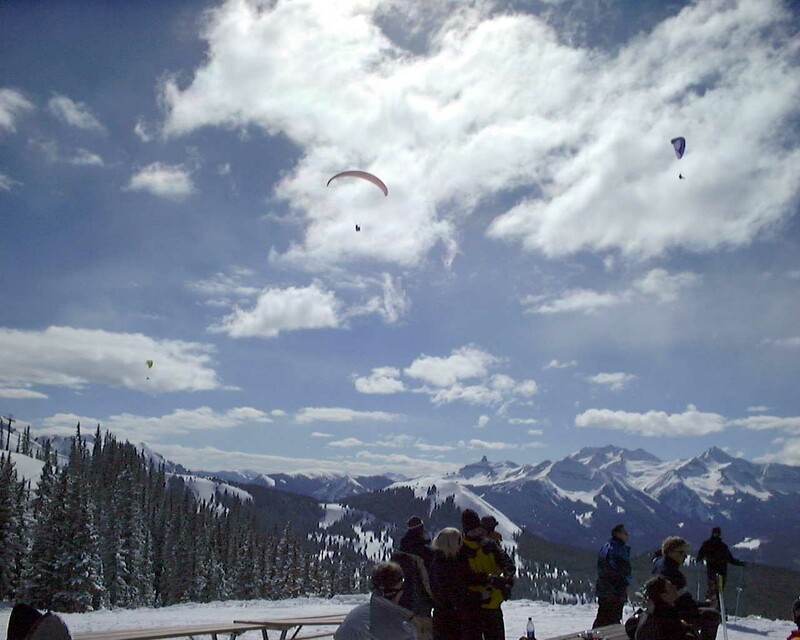 I am writing in response to some some things you have posted on your site from a trip to Colorado in March of last year. You speak of a woman who died during your trip. She was my best friend. 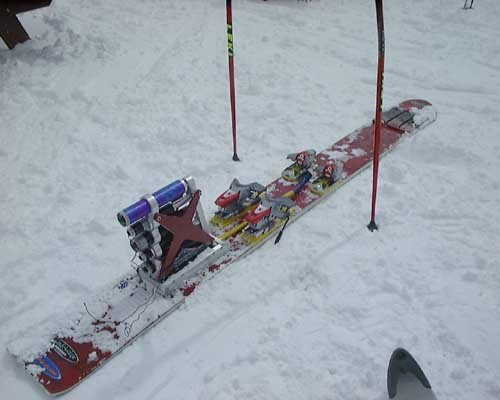 I understand why you used this situation as a way to demonstrate to other skiers and boarders what not to do. Believe me, I would certainly agree that she was not using her instincts. She lived in Lake Tahoe for a number of years and boarded all over Utah and parts of Canada. 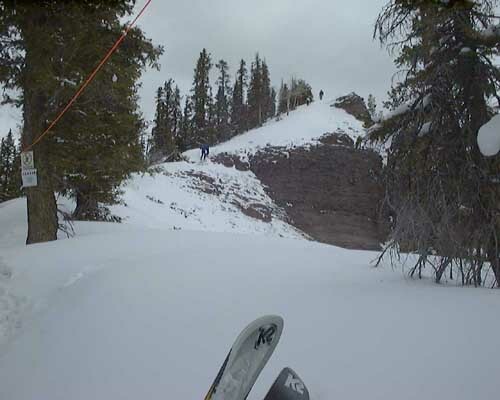 She was with a local man who knew the area and had skied the bowl before. It used to be an open run. 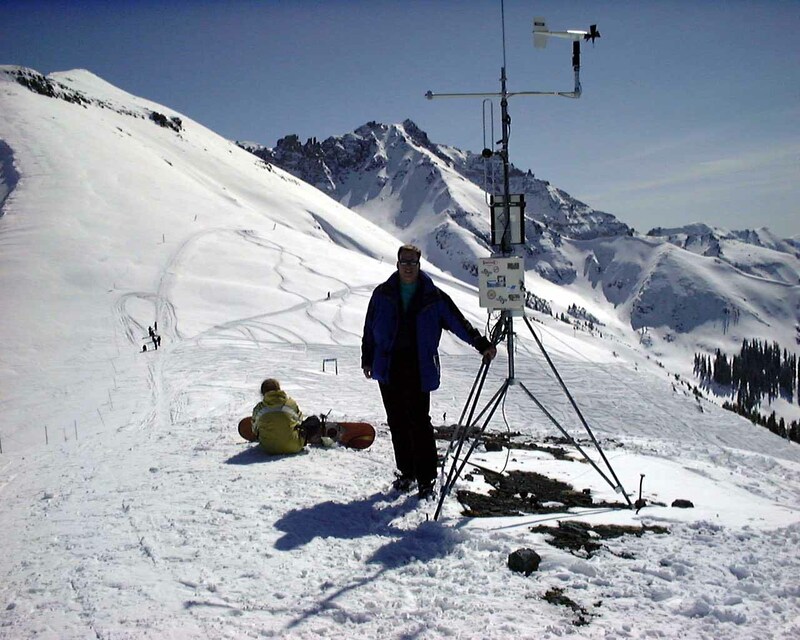 This local man lived with someone who worked on the ski patrol. It has always astounded me that two experienced snow boarders with resources at their fingertips did not use better judgment. I have read the reports. I know what happened. It seems interesting to me that you did not mention the other deaths from avalanches in the vicinity that occurred within 24 hours. These incidences occurred in unrestricted out of bounds areas. These were deaths of experienced people. You also left out that two skiers had gone down temptation bowl just 20 minutes earlier which didn't help her situation at all, but those tracks could have been misleading. 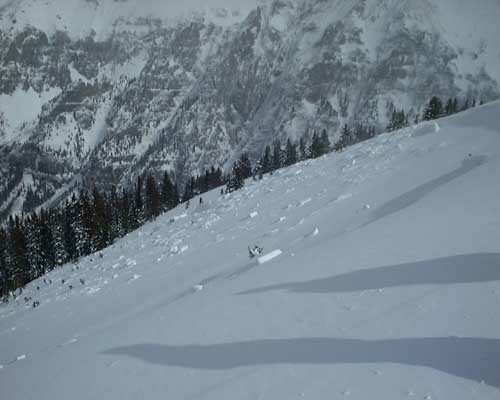 Last winter, according to official avalanche reports, was the fifth worst since 1950 in terms of avalanche fatalities. What I am trying to convey is that if you are trying to save lives of others who share your love of the snow and outdoors by using examples such as this, please site more concrete and specific reasons rather than insults. I know I am not the only one who has read your site and there are people that loved her and are hurt by your words. Calling someone stupid isn't going to save anyone else, but explaining the purpose of avalanche gear, checking avalanche reports and staying in bounds will. Her death certainly was senseless and happened as a result of her own actions, but believe me she wasn't a stupid girl. She made a mistake, which I am sure you have as well. The mistakes you and I have made thus far just haven't cost us our lives. Thanks for reading this and please keep warning people of the dangers of avalanches. Luckily there were half as many avalanche accidents in March this year but that is still too many. RESPONSE from (me) Brian Wilson to the above letter: This letter hit me pretty hard, I honestly didn't ever consider that anybody who knew this girl would read this web page. In the above letter, Stephanie writes, "She made a mistake, which I am sure you have as well. The mistakes you and I have made thus far just haven't cost us our lives." That is an enormous understatement, I have made some HUGE mistakes and only escaped with my life through some good luck. I acknowledge Stephanie's very valid point. I'm also sorry for any pain I caused with my callous comments, I honestly didn't mean any ill will or bad feelings toward the girl's family or friends. Here is a picture from a different direction seeing a big fracture in the snow. Under the red arrows you can see a huge fracture in the snow, marking an avalanche slide. (Click on the picture to see greater detail.) This is the same area the woman died in. A final picture of the town of Telluride from the ski slope.